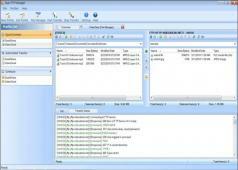 Auto FTP Manager is an intuitive FTP client which can help inexperienced users download/upload files and backup servers. The tool includes automated transfer rules for processing complex transfer jobs, a scheduler and logs storing information related to transfers. To manage transfer tasks easily, the application enables you to create multiple profiles. At first run you’ll be guided by a step-by-step wizard through the process of creating a new profile. The tabbed UI lets you easily work with multiple sessions simultaneously and you can start and stop transfers quickly. The application lets you transfer files between a folder located on your computer’s hard drive or a network drive and a FTP server, two FTP servers or two PC folders/network drives. Users can also backup their profiles and select between a quick connect profile which works for fast FTP connection through the included file manager or the automated transfer profile that lets you define action rules to automate transfer jobs. To enter FTP connection info, users can select the protocol and fill in details such as the user name, FTP address, password and port. The built-in file manager lets you handle your file transfers in a window with two areas. Various actions are available like creating new folders and text files, drag and drop items, cut/copy/paste/delete/rename files, add folders to the queue list, view item properties and others. In the dual window you can also view a log with details regarding the folders you transferred between locations and manage your queued folders.